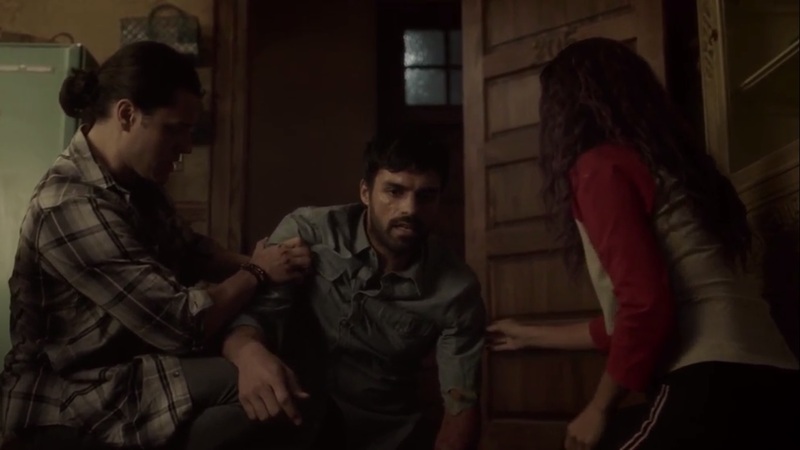 A Look at The Gifted- Season 2, Episode 3: “coMplications” | What Else is on Now? 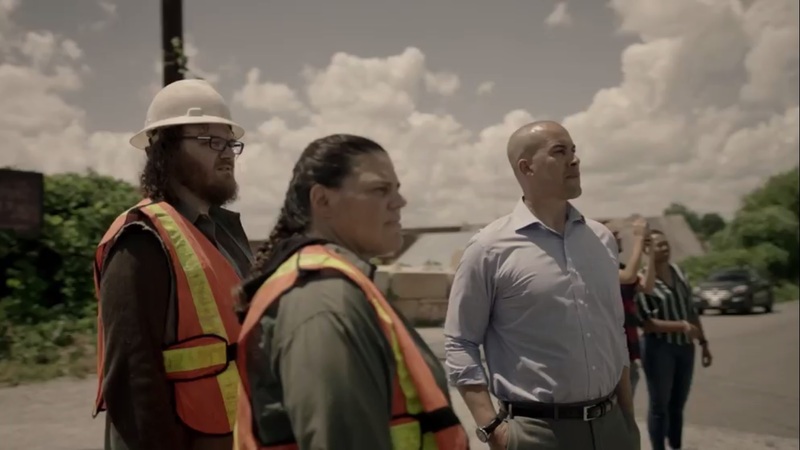 The episode begins with a flashback to six years ago outside Bogota, Colombia as Marcos tells his driving companion that he needs to enter this sanctuary alone. He enters the church and asks for Senor Sebastian, but the nuns don’t want any trouble. Well, Marcos has money, so at least that’s not trouble. Marcos enters to see his bedridden father, who is here apparently to die. Marcos tells his father that he made some calls and can get him into nicer places. There’s a better cancer center, but Dad shoots him down. He tells off his son, saying he abandoned him so he could make a choice, but Marcos won’t live a lie. His mother was already driven to an early grave, but Dad is happy that Mom won’t happy to see what Marcos became. Luckily, Marcos knows that his dad isn’t headed to Heaven. 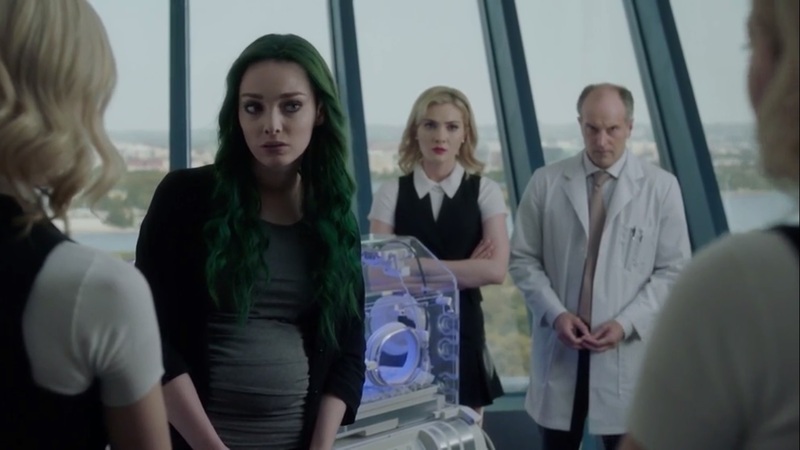 In the present, Lorna tells the doctor and the Frost Sisters that she wants Marcos around to help the baby- who isn’t eating and is sleeping far too much- since the machines are no good. The Frost Sisters, naturally, are against this, but Dawn’s jaundice might only be helped because of Marcos’ light powers. Surprisingly, Reeva agrees- Dawn needs her father. You know there’s probably a catch to this. Speaking of, a hungover Marcos awakens long after his late night light show. He comes into the main room just as Clarice and John- in the middle of discussing Erg- tell him to sit out the mission. Not only is he in no condition to help, but his light show is all over the news. The next he drunk dials his ex, he should let the others know. Noted. John tells Marcos to get his head right, as they’ll need him later. 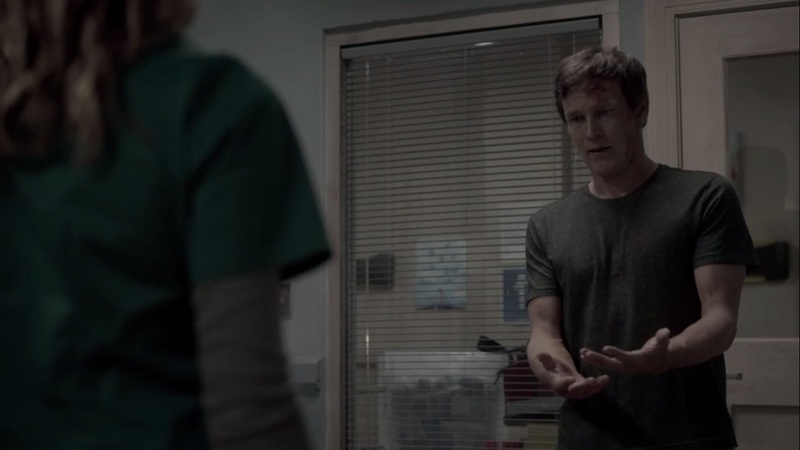 Later, Clarice asks John how he’s been doing since his visit with Evangeline, not to mention his bruised knuckles. He’s punched a lot of things, yes, but Clarice hasn’t seen his fingers like this before. They’ll heal, yes, but Clarice knows that everything isn’t fine. Reed, meanwhile, has flashbacks of his mutation before telling Caitlin that he has to meet Shatter in Baltimore. Before he can leave, though, Caitlin apologizes for going too far with her words yesterday, but she’s just worried about Lauren. She’s tried talking to her, but no dice. She asks if Reed feels something is off with him and Lauren and wants him to talk with Lauren. Hell, he can even take her on the mission to Baltimore. Andy pays Lorna a visit and asks if it’s the best idea to bring Marcos, but she’s doing this for her daughter. Andy knows that this will make it harder, but Lorna will do anything to save Dawn, even if that means a few minutes in a room with Marcos. Andy wonders if the child is indeed a mutant, but they won’t know that until she’s old enough to manifest. Still, Lorna knows that his daughter is a fighter. She better be a mutant. Magneto wouldn’t want some human granddaughter, after all. Marcos cradles his baby rattle at a diner when he hears a voice calling out to him. He heads outside and runs right into the Frost Sisters, who tell him that they don’t want a fight. Rather, they need his help because of the baby. And for security reasons, he has to place a sack over his head. 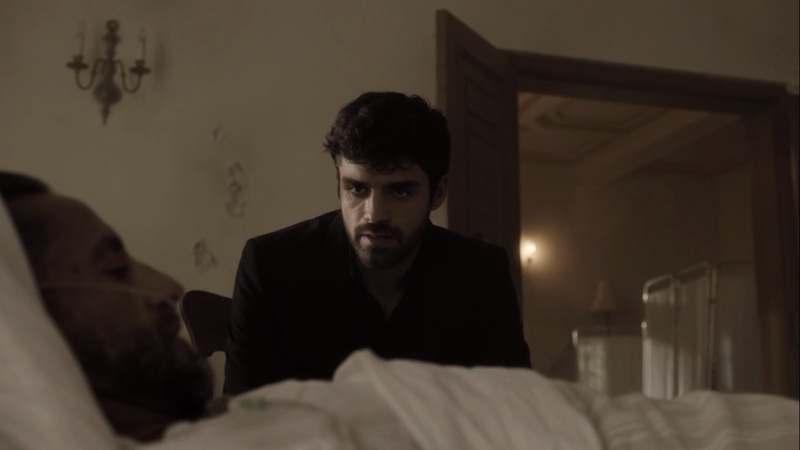 One of the sisters searches his thoughts and sees that Marcos is blaming himself, and if he wants to redeem himself as a father, he’ll do as he’s told. The Frost Sisters are dicks. Reeva interrupts Andy’s video game playing to tell him that she wants Andy by her side when Marcos arrives. No, not a security team, but him. Andy is hesitant, given that they were friends. Anyone can stand up to an enemy, but what happens when you fought next to someone? Reeva needs someone who is strong enough to stand up to their friends, and apparently that’s Andy. John and Clarice arrive at the spot to meet Erg, and they indeed have to enter the sewers. Tracking the area, John realizes that there are indeed others nearby. John realizes that someone is trying to get them lost. He places his hand on a wall and realizes that it’s fake, so the two of them pass through it. Back up above ground, Jace calls Paula, realizing that the phone went to voicemail yet again. He knows that she’s upset about him pursuing this hunch, but he figures she’ll thank him later. Good luck with that, buddy. Inside, Jace asks an officer if he can speak with the police sergeant regarding mutant incidents, but he’s just here as a concerned citizen. And this is more than just a tip. When Jace doesn’t get anywhere, he finally reveals that he used to be on the job and that he lost his daughter on 7/15. With that, the clerk asks Jace to have a seat while he gets the sergeant. 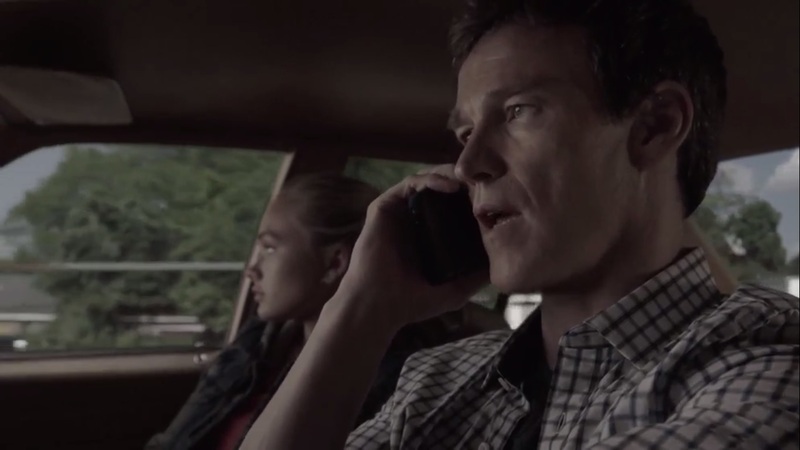 On the road, Reed tries to get Lauren to talk. She apologizes for what she said, but he wanted to know what was wrong and he’s glad she told him. He gets a call from Caitlin, who is looking for Inner Circle files, but she can’t find the cabinet. Reed’s excuse is that he’s getting it replaced, but that doesn’t explain the crack in the wall. As Reed continues his fake cover story, his powers flare up again. He hangs up the call just as his hands melt the steering wheel. And since you can’t steer without that, it doesn’t take long until Reed and Lauren crash. Well, at the very least this didn’t happen on a taxi ride. Naturally, Lauren is surprised to see her father’s abilities, but he’s concerned about being seen, so they ditch the car, grab the supplies, and leave just before some nearby construction workers inspect the car. They realize it’s probably a mutant thing, but by this time, Reed and Lauren are long gone. 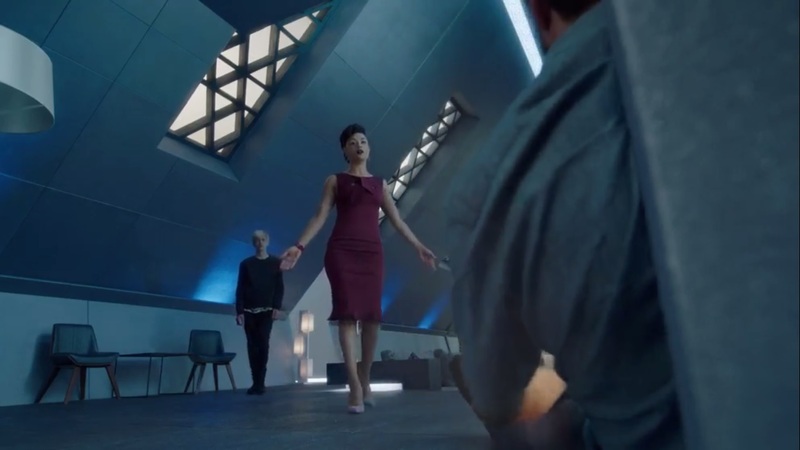 Reed apologizes for not talking about his powers sooner, but Lauren asks how long he was going to hide this. Before Reed can answer why he didn’t say anything, the two hear police sirens. Underground, John and Clarice continue to hunt the sewers that time forgot. John realizes something is interfering with his tracking. His frustration mounts, as he yells that they won’t give up, so Clarice wants to try something. She can see energy fields that she uses to portal, so she tries to look past what these people want them to see. They jump through the portal and are instantly surrounded by other mutants. 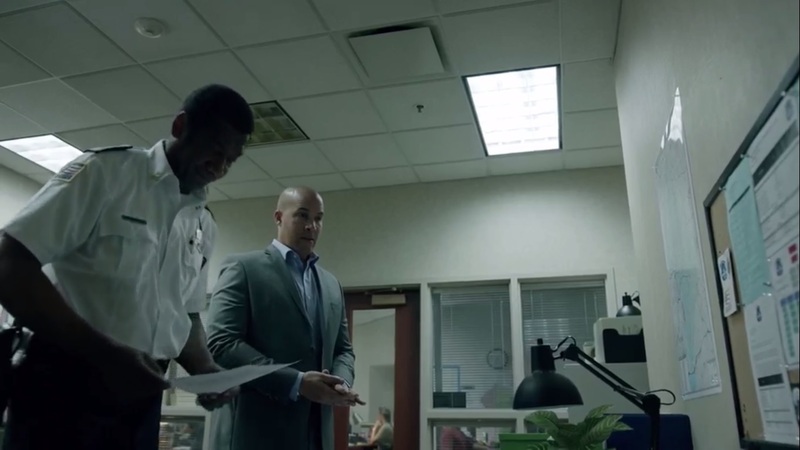 Jace presents his information with Sergeant Lopez, played by Robert McKay, saying that the green light in the sky matches the powers of Marcos Diaz. He then reveals that he once worked for Sentinel Services, so maybe now they can share their resources. If Jace is quiet, he can see what the cops have to offer. though what he’s given isn’t much to work with. He then overhears the police call about a mutant incident in Landover. Marcos is finally brought before Reeva Payge, who tells him that his child has come down with a stubborn case of jaundice. 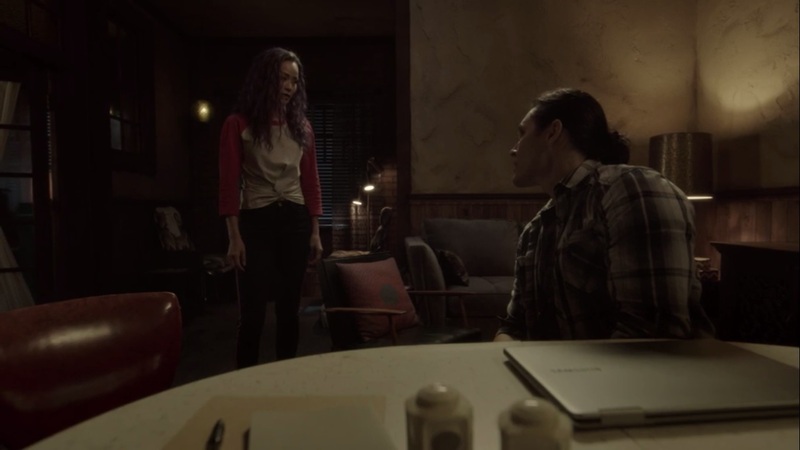 Though Marcos would prefer to talk with Lorna for awhile, he’s only allowed to help the baby and leave, and he’s not getting any help from Andy right now, either. Tough visitation rights for mutants. Finally, Lorna and Marcos reunite. She thanks him for coming, even though he didn’t have much of a choice. 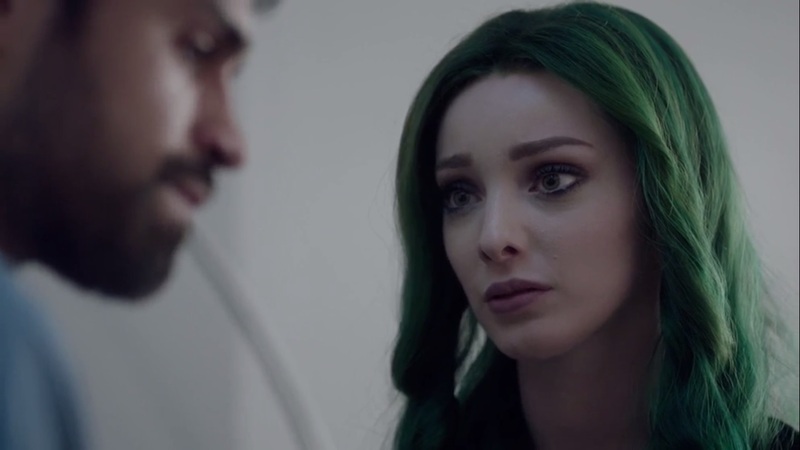 Lorna isn’t looking to reconcile- she just wants him to help Dawn, which means “Aurora,” which also sounds like Ororo. Okay, I’m finished. 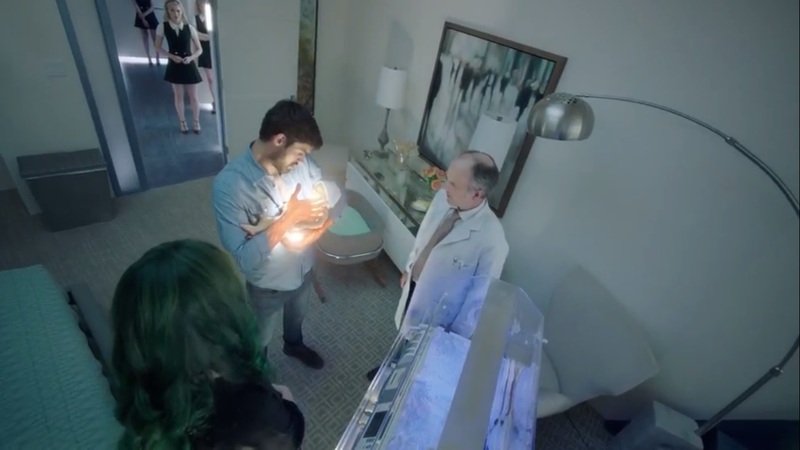 They haven’t been able to find the right frequency for the light therapy to help Dawn just yet, so Marcos cradles his daughter and begins to emit his light energy over her. Underground, John and Clarice are brought before the leader, Erg, played by Michael Luwoye, and explain that they just want to talk. However, Erg only wants to talk to Clarice, who is confident that she can handle this guy herself. She tells him that their friends were taken by the Inner Circle and they need to know what’s happening. Luckily, Erg can use someone with Clarice’s abilities. As a visible mutant, she has a link to the underground and those who choose not to hide their nature. Plus, Erg doesn’t really see Clarice’s actions as helping mutants. Over in Landover, police inspect the car crash. Since mutant forensics showed up, it must be mutants. No sign of them, though, but Jace then spots a nearby fence with blood on the pole. As he goes on the hunt, Reed begins to hotwire a truck. However, with him in no shape to drive, Lauren takes the wheel. The two speed off just before Jace can pursue them. Erg brings Clarice to the real mutant underground. The Morlocks are mutants who live underground because they choose freedom and to live beneath the ground. Those who can pass in the world above mark themselves with an “M” on their cheek. To Erg, the X-Men fought not for freedom, but tolerance. There’s a key difference when you take into account that people merely tolerate what they hate. He points Clarice to one mutant, Mara, who uses sound to get around, like a bat. One day, some Purifiers heard her and, thinking her clicks were a threat, beat her and cut out her voice box. Erg will protect his people, but he needs help in return. In exchange for information, he needs eyes on the world above. In essence, he’s asking Clarice to be a spy. Reed discusses his powers with Lauren, saying that they shouldn’t tell Caitlin. Lauren doesn’t want to keep secrets, but the family is a mess. Still, Lauren knows that lying will make things worse. To Reed, he wants to figure out what’s happening, so Lauren thinks back to sophomore year. She was at a friend’s place when mutants came by and broke the windows. 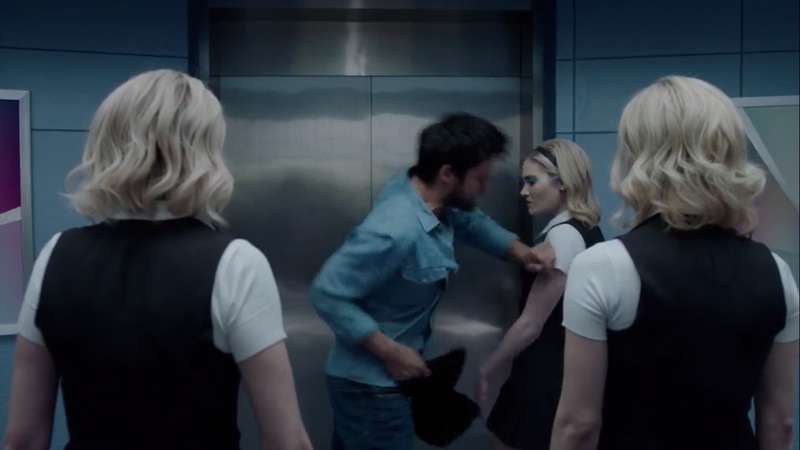 Lauren was frightened, but it turns out that she broke the windows with her powers when some boy tried to grab her. He backed off once stuff started breaking. 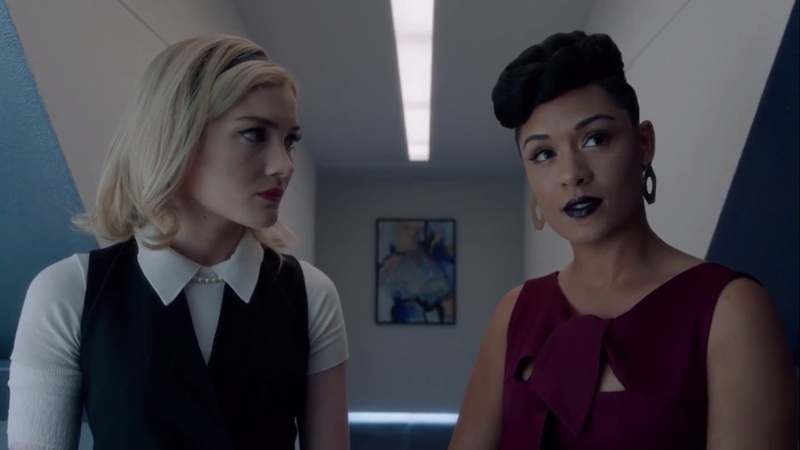 Lauren didn’t say anything because Reed told her not to worry since his job was prosecuting mutants. He would protect her. After that, she said nothing because she didn’t want to hurt the family, but what if she had? Maybe things would different with her and Andy. Maybe none of this would have happened. Clarice finally returns to John, saying that she talked to Erg. 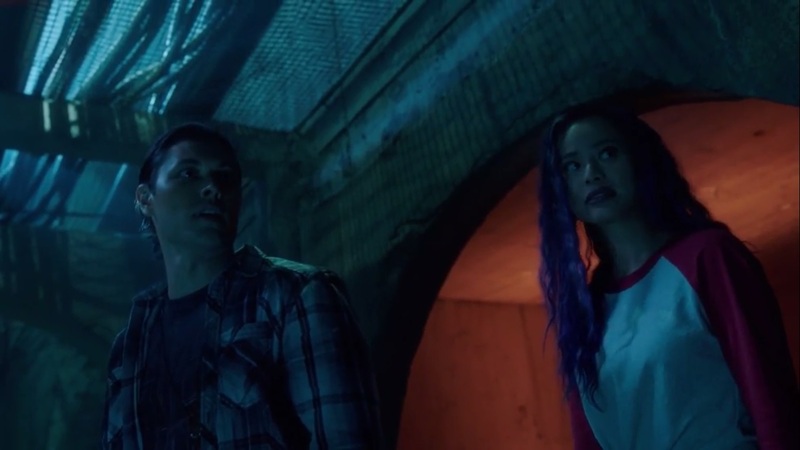 She informs him that there’s a mutant here who can watch the world above through the green goop that they passed while exploring the tunnels. The Frost Sisters were in a utility tunnel and tapping into a data cable under the Department of Health, but that’s all they know. Marcos continues to care for Dawn, whose bilirubin levels are finally back to normal. So yeah, Marcos’ job is done. He gives Lorna the rattle as a parting gift, saying that when she left in Nashville, he didn’t want anyone to get hurt, so he let her go. He pleads for Lorna to come with him. Lorna loves him, yes, but Dawn needs more than love. They’re building something greater. 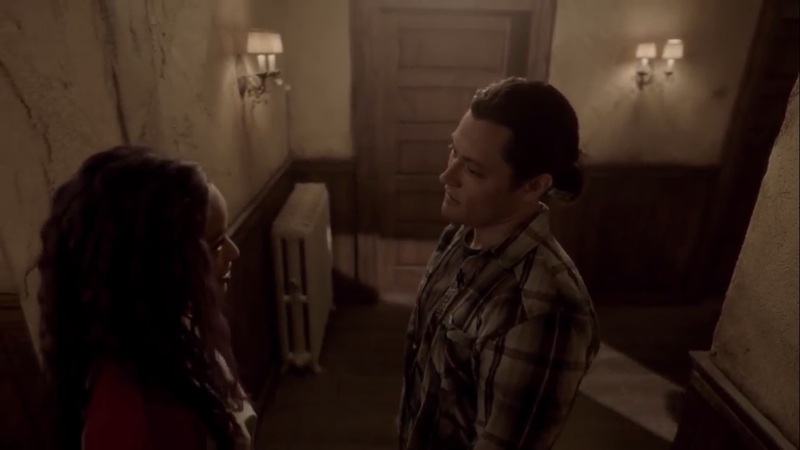 Marcos offers to stay, but Lorna knows that won’t work, as Marcos won’t fit there. Marcos doesn’t want to abandon his daughter, but Lorna reminds him that he’s not his father. 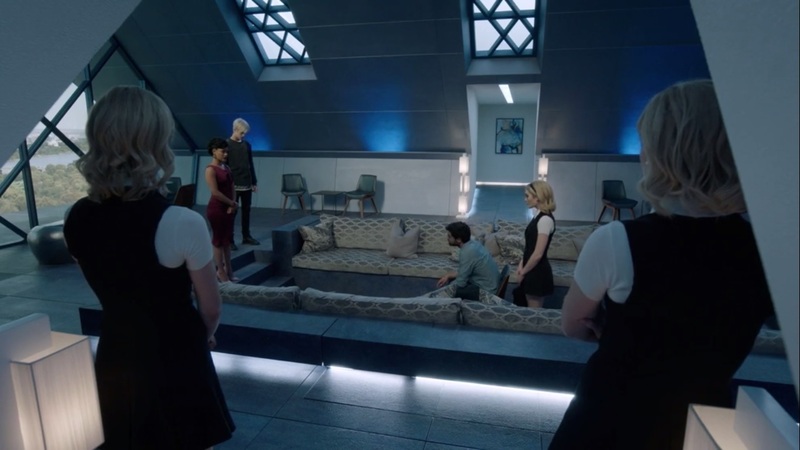 The Frost Sisters pretty much force Marcos to leave with their telepathy, but Marcos’ anger explodes. He yells out to Lorna that the Frost Sisters are lying to him. He goes on the offensive, burning the arms of one of the Frost Sisters. 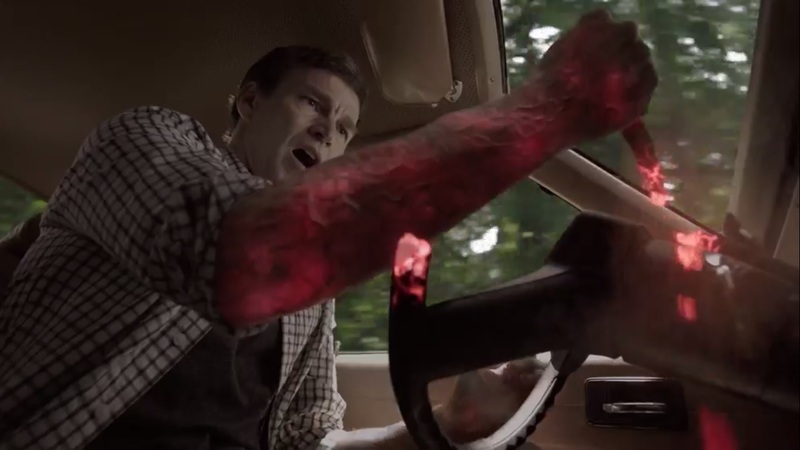 Before he can go after Reeva, though, she uses her powers, causing his light abilities to backfire- she damn near burns his arm- and sending him to the ground in a daze. With that, Andy will now help Marcos to the door. 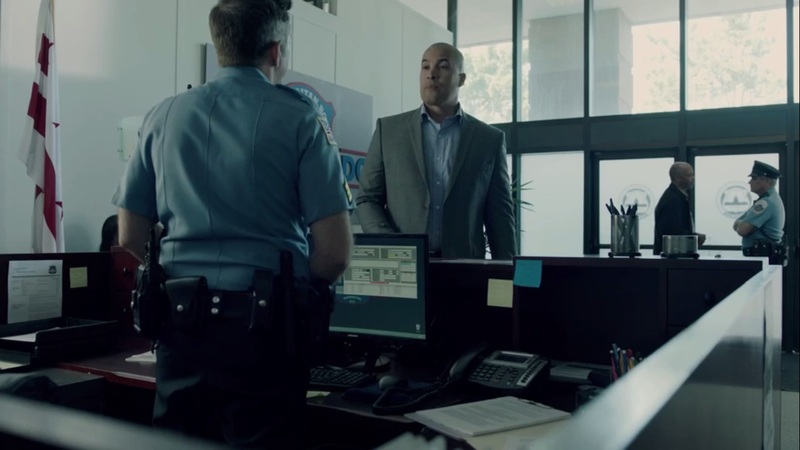 Jace returns to the police department and tells him that he spotted the fugitives, saying the two looked like Reed and Lauren Strucker. 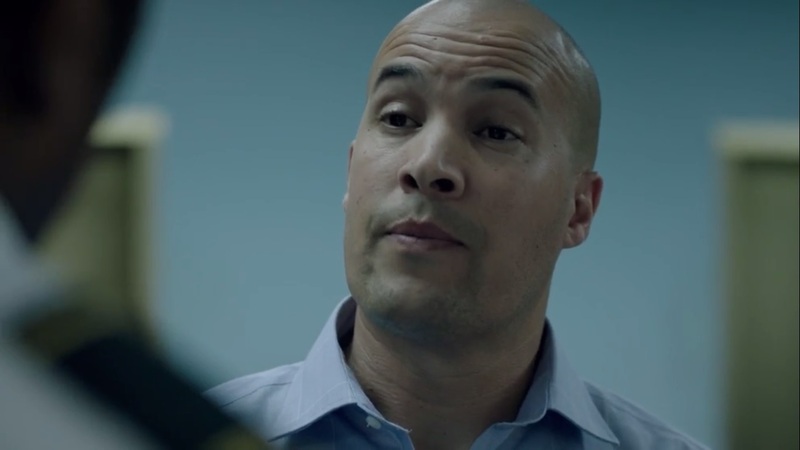 Sergeant Lopez, though, tells Jace to leave, saying he looked into his Sentinel Services past and what went down in Atlanta, not to mention Jace’s unprofessional behavior. 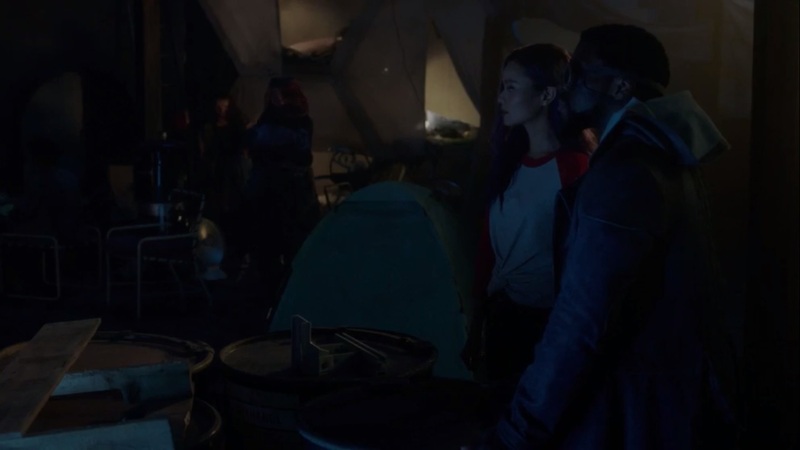 Jace’s anger gets the better of him and he tries to say that the mutants aren’t dead, but Lopez wants Jace gone. Now. John does some research back at base. If the underground can find out what the Inner Circle got from the Department of Health, this could be useful. He asks Clarice what happened when she went with Erg, and she explains that there’s an entire society down there. Clarice managed to talk Erg into helping, as they couldn’t go home empty-handed, and with John desperate for answers, she did what she could. The problem isn’t the two of them, though. 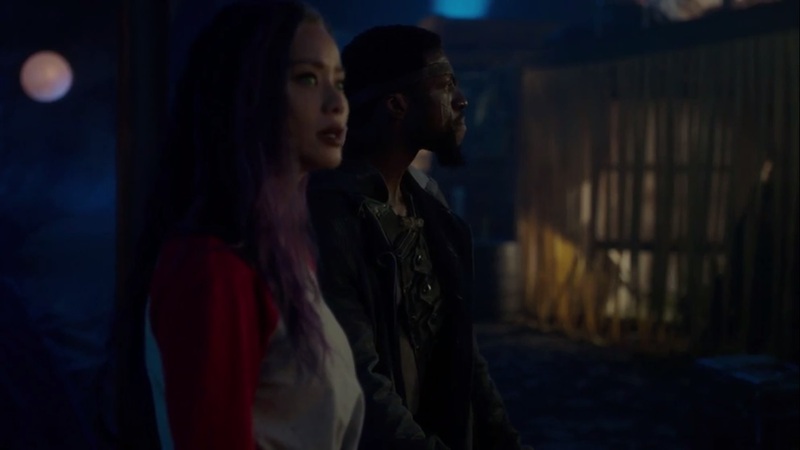 He tells her about Evangeline calling him a failure and saying that Andy and Lorna won’t leave the Inner Circle, so the underground will probably have to kill them. John continues to blame himself, and he doesn’t know if he could go through with that. Suddenly, an exhausted Marcos arrives, and he’s livid and ready for a fight. Reed meets up with Caitlin at the clinic and admits that he’s been struggling with something. He tells her that his father thought he suppressed his powers permanently, but he was wrong. He explains that he destroyed the file cabinet, his wedding ring is gone, and he destroyed the dashboard of the car. He tried to get it under control for six months. As he had these headaches when he was a child, he read his father’s research, but it hasn’t helped yet. He apologizes for not telling Caitlin sooner, but he acknowledges that he doesn’t know what he’s doing right now. At the very least, Caitlin isn’t angry, so there’s that. With the baby now healed, Lorna cradles Dawn while levitating the rattle. Reeva wonders how Marcos got free, and the answer is simple: while the Frost Sisters can put thoughts in people’s minds, it’s hard to overcome a feeling that strong. Ha! The power of love works wonders. Reeva reminds all of the Frosts that their plans are bigger than any of them realize. They’re creating something special, so it’s time to get to work. This revolution isn’t going to start itself, after all. The power of love is a curious thing. It makes one man weep, and another man sing. And in the case of Marcos, it fills him with such unyielding rage. 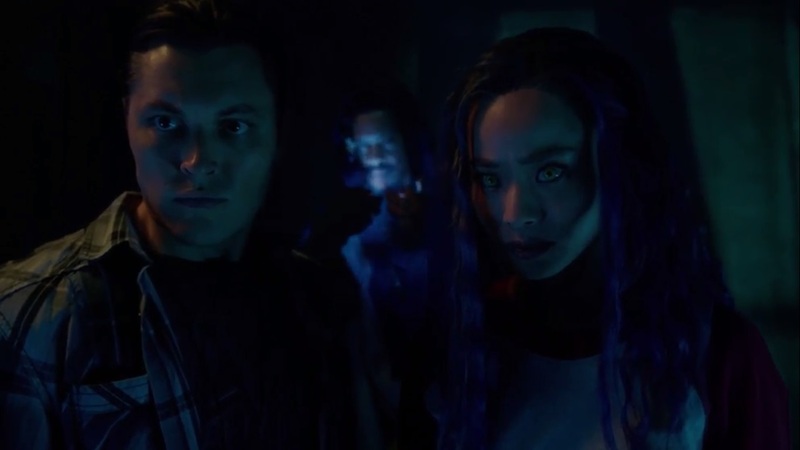 While The Gifted gets flack from some for not having more action, the more dramatic moments make for an engaging watch due to the interpersonal problems and, per the episode’s title, coMplications. Marcos is in the difficult position of being separated from his child and virtually powerless to do anything about it. 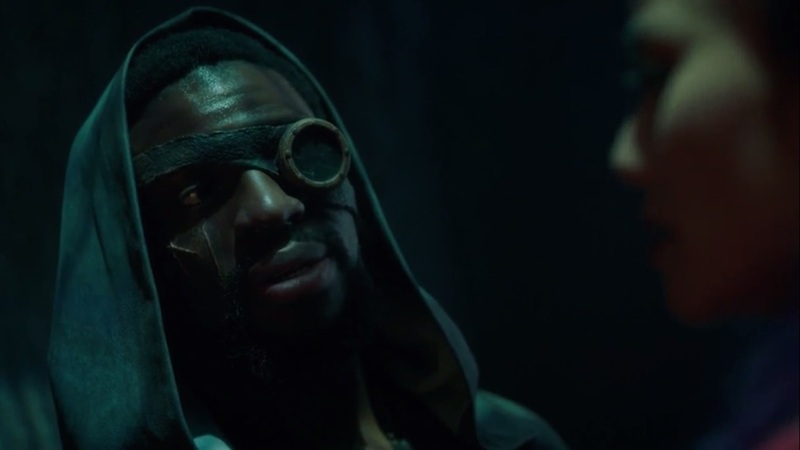 The opening flashback helped set up his conflict this week: he’ll do anything not just to help Lorna and Dawn, but also prove to himself that he’s not his father. 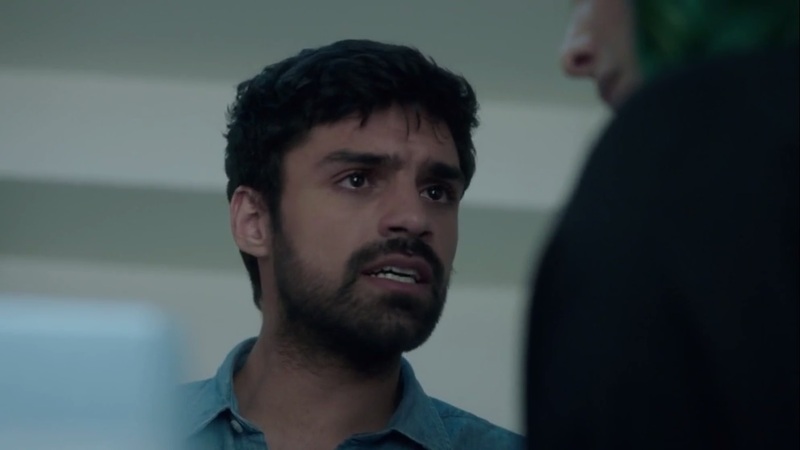 We see this frustration weighing on him and Sean Teale is excellent from start to finish in showcasing Eclipse’s anger, sadness, and frustration at being frozen out when he finally has a chance to see his child. Not only does Lorna rebuff his call for her to return to him, but he’s pretty much on a leash the entire time he’s with the Inner Circle. 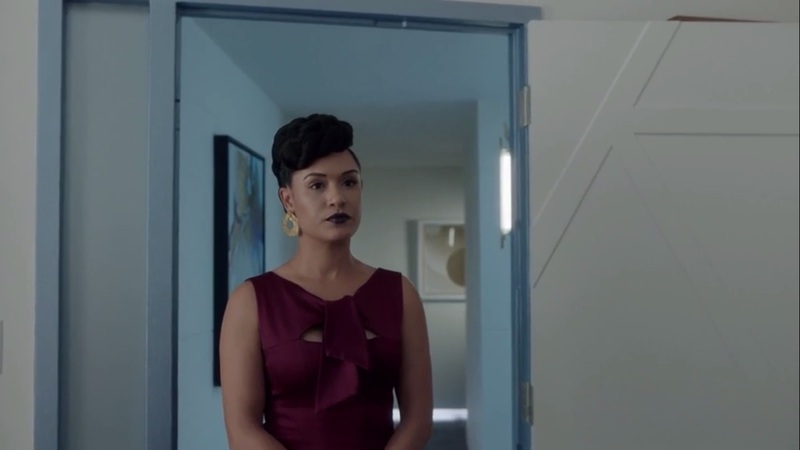 Him shining a light got Lorna’s attention and he’s already ripped away from her yet again. The reasoning behind using Marcos does make sense, though. 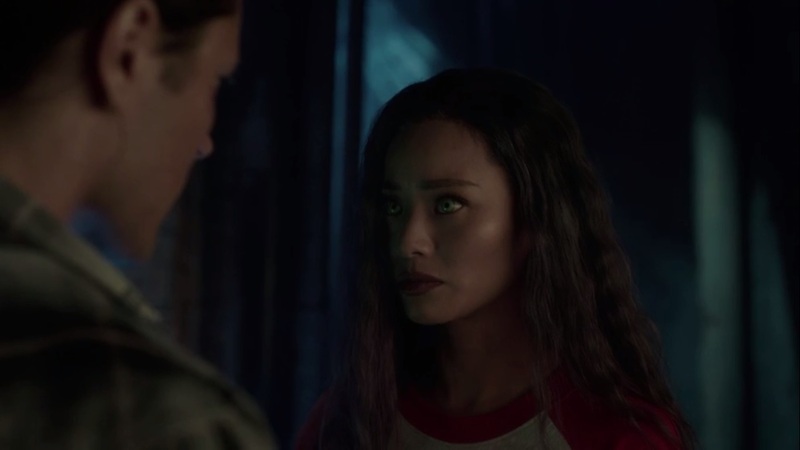 Sure, with her resources, Reeva probably could find a mutant with similar abilities, but Marcos is close by and available, and she can dictate the rules, as she did, so I buy them going to Marcos when no other solution is helping Dawn. 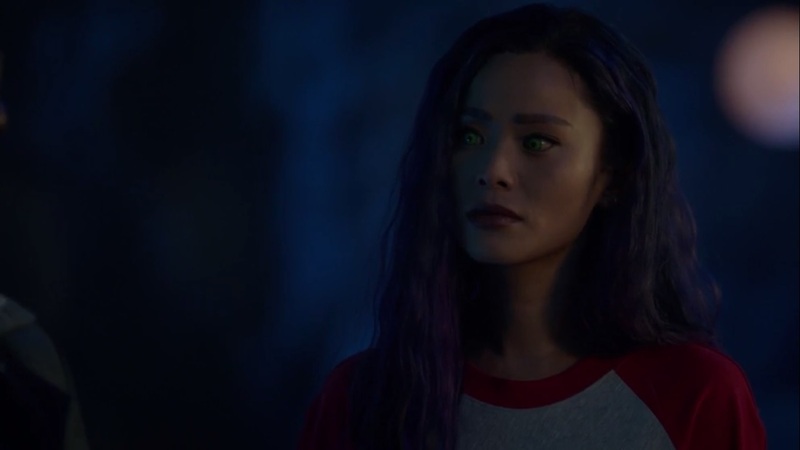 It’s hard to tell if Lorna is really giving Marcos the cold shoulder because she doesn’t care for him as much as he does for her or if she just requires more than he has in regards to Dawn’s future. 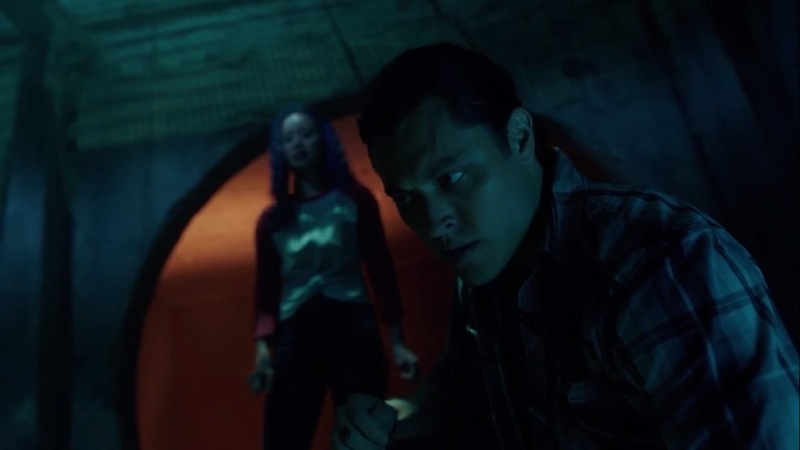 After all, the mutant underground has limited resources compared to the Inner Circle, but it is sad to watch her brush him aside and just use him to help the baby. That said, she does still keep the rattle when she could have told him to take it with him. And she did have that talk with Andy previously about Reeva’s potential intentions with the baby, so maybe part of her is holding out, but she has to put up a good front for both Reeva and the Frost Sisters. At least, so they don’t suspect something is off like Reeva did with Andy. It was nice to see Marcos go on the offensive after being effectively restrained for so long. I imagine he could have done more harm to the Frost Sisters if he wanted to, but held back. And between being ripped from his child and Reeva using her powers on him, the Inner Circle has just unleashed the beast and no doubt did more harm than good. Now they know that Marcos will be on their asses. So that’s one complication out of the way. The Struckers may not get in as much on the action just yet, but they’re getting their problems out in the open to prevent future complications. If The Flash is any indication, it’s that keeping secrets causes more problems. So it’s a refreshing change of pace for Reed to come clean to Caitlin. 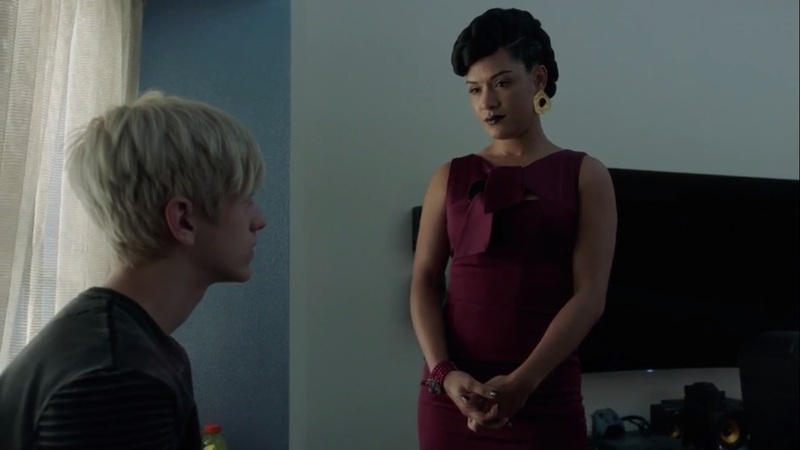 Admittedly, he had no choice, as it was only a matter of time before his powers came up at the absolute worse time, but this provided an opportunity for him and Lauren not just to bond, but discuss the dangers of keeping secrets and how things might have changed had they been open from the start. I can only assume that, from here, Reed comes clean to Clarice, Marcos, and John as well. 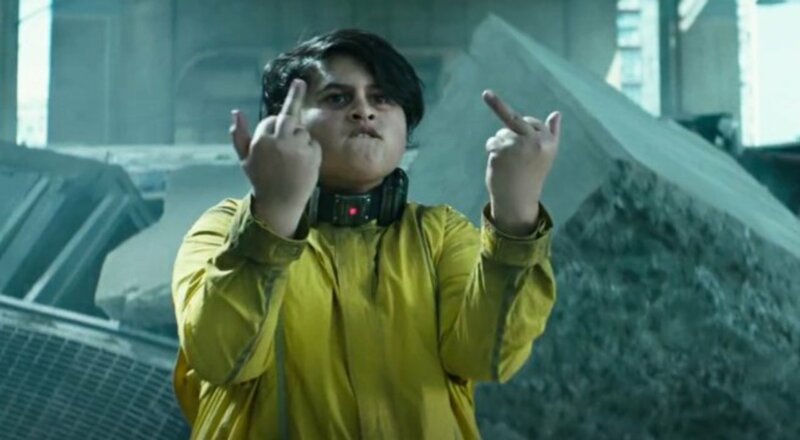 Plus, maybe by doing this, they can shed some light on just what Reed’s powers are, because I watch him burn things and am immediately reminded of Fire Fist’s powers in Deadpool 2. And I’m probably saying that because, yes, it’s an X-Men film. Speaking of X-Men, we get another touch of mutant lore with the introduction of the Morlocks. They’re underground mutants who look deformed and hide themselves away from society. Sounds about right and both they and their lair translate to screen very well. Michael Goi’s direction this episode shows off the Morlocks as being this unwanted world and it’s a great introduction. Hopefully we see more of them. The fact that, presumably, this timeline has no Mister Sinister, Marauders, or Gambit, maybe there won’t be a Mutant Massacre. Yet. Oh, and on a brief aside, Dreamer was once a member of the Morlocks in comic lore. And as someone who stubbornly refuses to believe that Dreamer is 100 percent gone- though I’ll admit I’m wrong if that truly is the case- I have to wonder if this could come up in conversation at some point in the season. But back to the Morlocks. This meeting puts Clarice in a complicated position with her being asked by Erg to spy for them, but really, it doesn’t have to be. Blink could just tell John and the others about what Erg requested. After all, they sought him out and he did provide information. Sure, they may take issue with the spying aspect, but I don’t see a real reason why Blink would intentionally keep this from the others. As is, again, I do enjoy seeing the relationship between John and Clarice remain as stable as it has been. 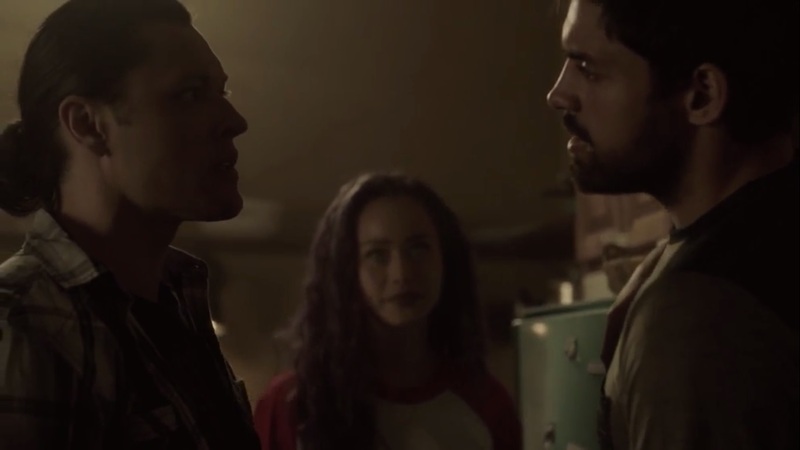 They’re both being open with one another and Clarice constantly challenges John to open up, and it’s good that he brought up Evangeline calling him a failure, as that’s still a fresh wound for him. Some would probably call it sappy, but I enjoy their moments together. Jace is caught in a hard place. 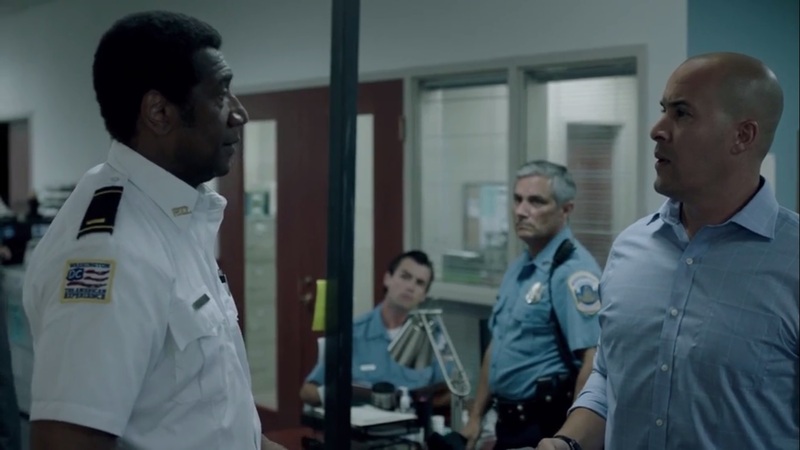 Paula isn’t pleased with him going after this hunch, and now the police don’t want him around after he took it upon himself to investigate the Landover incident. Sure, he was right at the end of the day, but he’s not an officer of the law anymore. He can’t request the police’s help and overstep his boundaries without expecting them to banish him. Hell, at this point, I’m expecting him to just become a mutant bounty hunter. Create your own rules, Jace. No one’s stopping him and he knows enough about the group from Atlanta to at least piece some things together. Why constrain himself by trying to work within the confines of the law? Just seems to complicate things even more. 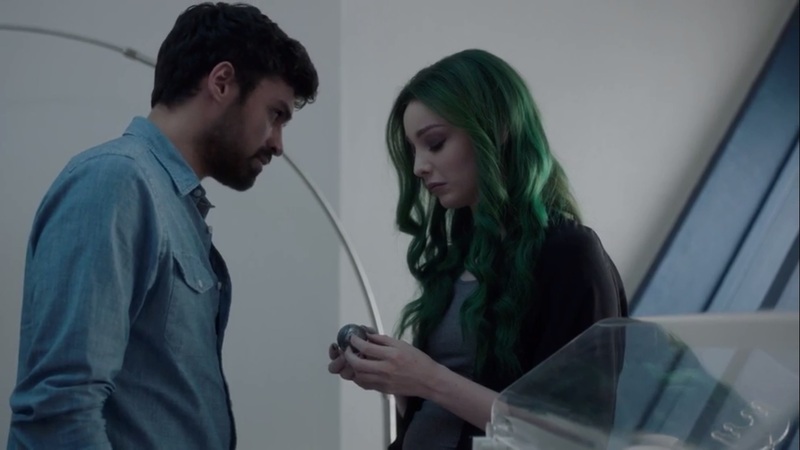 This season of The Gifted has had no shortage of emotional, character building moments and this episode is a strong indication of that, full of great acting, particularly between Sean Teale and Emma Dumont with Eclipse and Polaris’ short-lived reunion. But now Marcos is on the warpath, and I’m not talking about Days of Future Past, either. Plus, the introduction of the Morlocks to this X-Men world was a great addition. But like Reeva said, it’s time to get to work. So we’ll catch you all next week for The Gifted. This entry was posted in The Gifted and tagged Andy Strucker, Blair Redford, Brad Carter, Coby Bell, Emma Dumont, Erg, Erinn Ruth, Esme Frost, FOX, Frances Turner, Jace Turner, John Proudstar, Lauren Strucker, Lorna Dane, Michael Goi, Michael Horowitz, Michael Luwoye, Natalie Alyn Lind, Paula Turner, Percy Hynes White, Phoebe Frost, Polaris, Reed Strucker, Robert McKay, Sean Teale, Skyler Samuels, Sophie Frost, Stephen Moyer, The Gifted, Thunderbird, Wire, X-Men by omarid513. Bookmark the permalink.